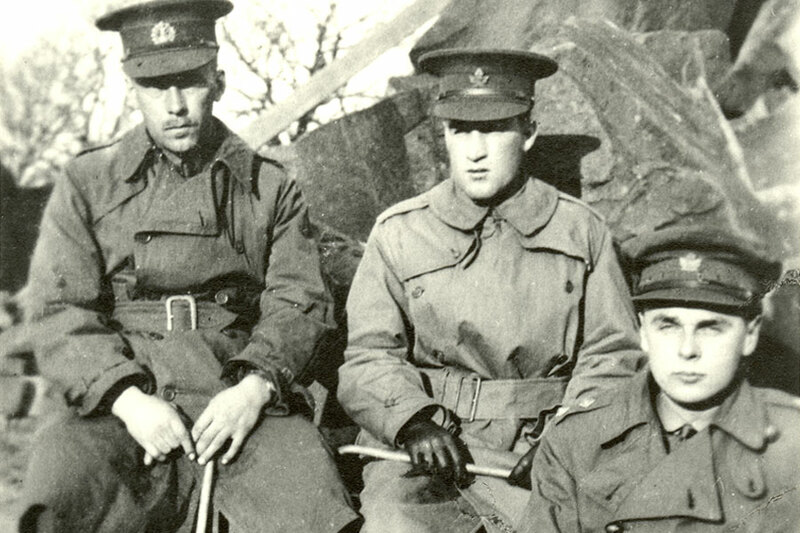 Left to right: John Einarson from Yorkton, Allan Macmillan and John Diefenbaker seated on rocks holding canes in England. Born in Clermont, PEI in 1892, Michael Allan MacMillan came to Saskatoon in 1909, drawn west by the great promise of the province. He entered the University of Saskatchewan in 1911 and quickly emerged as a top student. He was athletic and well-liked, serving as president of the Student Representative Council. His Sheaf profile reads in part—"All who know Mac expect great results in his chosen career, the Law, and wish him every success." MacMillan put aside his law books when he enlisted in Regina in August 1916 and joined the 105th Fusiliers, 1st Canadian Mounted Rifles. He was a good friend of another student overseas—John Diefenbaker. Lieutenant MacMillan, a man of great promise, was killed on 9 April 1917 during the Canadian capture of Vimy Ridge and is buried in Nine Elms Military Cemetery in Thelus France (just north of Arras). His memorial ribbon in on the second floor (northeast) of the Peter MacKinnon Building. His brother William was Conservative premier of Prince Edward Island from 1933-35. Image from University of Saskatchewan, University Archives & Special Collections, John G. Diefenbaker fonds MG 411, JGD 67.